Krzysztof Jotko broke out of a three-fight losing streak with a dominant decision win over previously undefeated middleweight Alen Amedovski. The 29-year-old Pole (20-4) smothered Amedovski (8-1) for the better part of three rounds to earn 30-25, 30-26 and 30-26 scorecards. Main Card getting started in St. Petersburg with Polish middleweight Krzysztof Jotko (19-4), who has lost three in a row. He faces 8-0 Alen Amedovski, out of Macedonia. Movsar Evloev closed out the UFC Fight Night prelims in St. Petersburg by earning a decisive unanimous decision victory over Seungwoo Choi. Judges scored the fight 29-27, 29-27 and 29-26, after Evloev had a point deducted in Round 2. 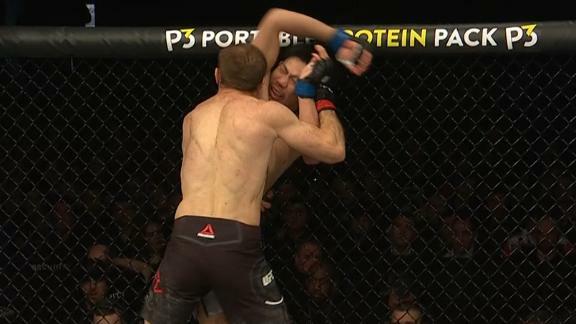 Alexander Yakovlev's guillotine choke makes Alex Da Silva tap out in the second round. For more UFC action, sign up for ESPN+ at https://plus.espn.com/ufc.